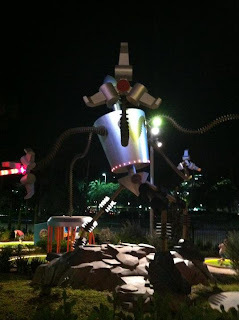 As with my last post, the following update comes courtesy of my recent anniversary trip to Universal Orlando Resort. My wife and I went on two separate nights and played both courses at Hollywood Drive-In Golf. Although we did not set course records with our scores, we had a blast. The courses are especially good for killing a bit of time when everyone is rushing out of the parking garages at park closure. I would like to thank my wife, Jennifer, for assisting with this blog post. Lets get started, shall we? 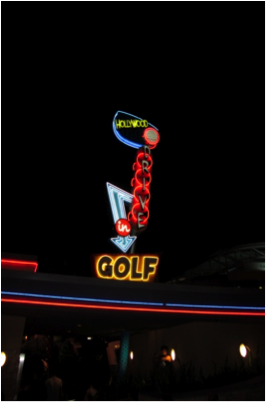 Hollywood Drive-In Golf, located in City Walk at Universal Orlando Resort, is a diversion worth trying out. 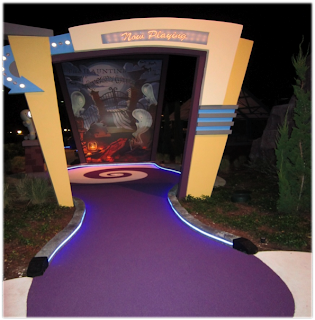 There are two courses that you can take advantage of, either The Haunting of Ghostly Greens, a haunted/horror movie based course, or The Invasion of Planet Putt, a sci-fi based course. 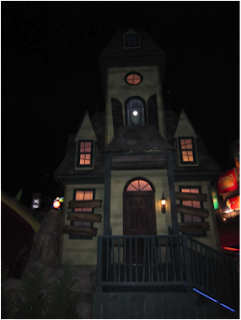 It was said that the sci-fi course was more difficult, but the haunted course was more scenic. However, both courses offered a variety of obstacles to deal with to reach the hole. Even though the operating hours offer the option for you to play from 9am-2am, it is illuminating to play after dark on both courses. There is a discount of $3 per person if you choose to play both courses and pay in the same day. They offer a rain check if you do not want to play them both in the same day, but just be sure you hang on to your receipt. However, if you decide to play only one it will cost you $13.99 a person for adults and $11.99 for children, but adding in the other course will cost you a total of $24.99 for adults or $20.99 for children. The clubs are also brightly colored with neon green and purple, as well as the holes on each hole being lit up outlined with lights. If you want a souvenir, you can purchase a golf ball with various colors or graphics to remind your experience. Don’t forget to ask for your discount if you are a Universal pass holder or a Florida resident. I also noticed that you can find 10% off discount cards at many of the restaurants around CityWalk. Now, on to the courses! As you move from the first hole to eighteenth on the haunting course you see ghost in the hedges and watching over the course. Watch out for the blast of air and water coming your way as you move over the bridge of one whole as you go by to complete the hole. 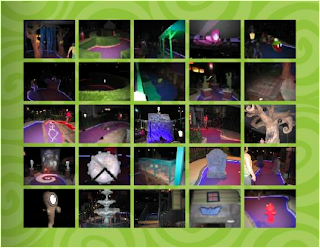 There are many special effects and gadgets along the way which capture your ball to take it up to be taken to the drop zone to be let out far or near the hole depending on the way it may go. Continuing to move through the maze, haunted trees, and grave yard sceneries all offer something eye catching to make the course more enjoyable along the way. 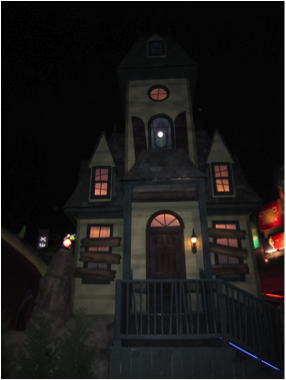 The haunted house at the 18th hole offers an obstacle that calls for the right force and aim to hit the right spot of the broken stairs for your ball to go inside to complete the last hole of this course, but if you don’t hit it just right or hard enough it will come right back to you to repeat your shot as many times as you need to make it in. There are many other times that if you do not hit the ball hard enough or at the right angle it may come back towards you to call for a repeat of your shot, but hang in there and don’t let the ghostly haunts scare you away. The sceneries and effects take into account some of the funny aspects of old and new horror movies alike. This was a memorable adventure throughout this neon course with purple greens. Let’s take a trip to the sci-fi adventure incorporating components from the early sci-fi to ideas we still think of today. From the start of this course till the very end (where you reach the monster’s mouth) there are twists and turns along the way. The greens stand out with bright green with bright yellow and orange added in along the way to highlight areas of the course, as well as the outlining lights which make the shape of the layout standout. A tri-level circle hole is the starter that gets your journey underway for this course. There is a large robotic structure that is the center of attention for this course with its multiple arms stretched out in different directions. Moving throughout the course you will be greeted by little alien figures, stars, pumpkin or alien head scare crow and a giant bug, but don’t forget to keep a look out for the big eyed cows with the random noise that it’ll make as you walk on by. No sci-fi scene would be complete without some UFO’s along the way, a space ship to enter into and even a farm area with a barn and corn crop for those ever so famous crop circles. Other aspects included don’t leave you short of fun with the circle of bars that act like a trap, a psychedelic old television to capture your ball and watch it on the screen as it goes on through, objects suspended up by squiggly monster arms and even an old outhouse along the way. There is a three eyed monster waiting for you at the end with its mouth open wide and tongue stuck out ready for you to hit the ball inside its mouth. It’s not so easy though because there is a twist at the end as a circle area containing the hole is continually spinning within. These old school sci-fi scenes and effects make this course a fun filled course worth a look. It was worth the time and experience to make some memories from our trip to play this course and its neighboring one. 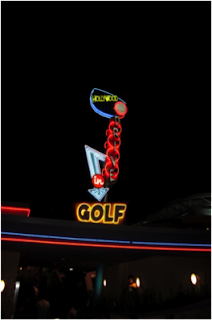 Hollywood Drive-In Golf is an excellent addition to Universal Orlando Resort. We really enjoyed playing both courses, but have to give a nod to The Haunting of Ghostly Greens as being our favorite and choice if you can only do one course. I recommend giving them both a shot and deciding for yourself which course you find to be superior. Thanks for looking at this continuation of my Anniversary Trip Report! If you have any questions or comments, you can leave them here or tweet me @MrX_381, my wife @UGAGirl23 or @Parkscope. You can also find us on Facebook! All pictures not marked otherwise were taken by my wife and me. Please excuse the quality as they are from our iPhone.